Sandwiches are a mainstay on nearly every menu across the country. In this episode, Martha reimagines five classics: Roasted Chicken Club, Po’boy, Muffuletta, Breakfast Egg Sandwich and the classic Reuben. Easy to make and portable, they’ll inspire you to make each of them. 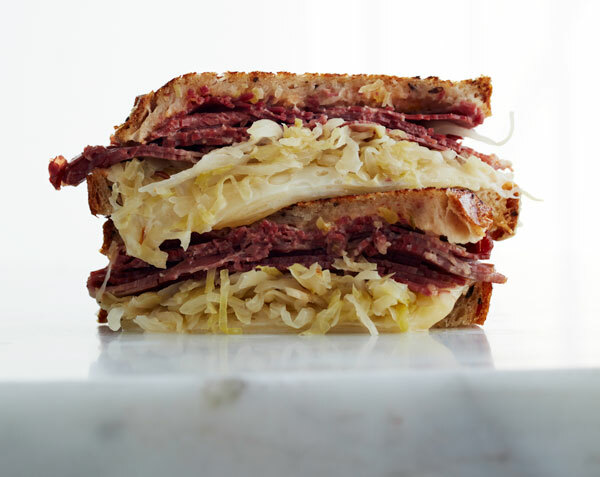 Martha Stewart demonstrates how to make a classic reuben sandwich. Martha Stewart's reuben sandwich recipe appears in the "Sandwich" episode of Martha Stewart's Cooking School. For the Sandwich: Place one slice of bread on work surface and top with the corned beef, sauerkraut, and Swiss cheese. On the other piece of bread, spread one side with Russian dressing or spicy brown mustard. Place dressing-side down on top of Swiss cheese to form a sandwich. Heat a cast-iron skillet over medium heat. Add 1/2 tablespoon butter to the pan and place the sandwich on top of the melted butter. Cook until golden, pressing down with a spatula, about 2 minutes. Lift the sandwich from the skillet and add the remaining 1/2 tablespoon butter. Toast the other side of sandwich until golden and the cheese has melted, 2 to 3 minutes. Serve with pickles. For the Dressing: Combine all of the ingredients in a small bowl. Dressing can be covered and refrigerated for up to 1 week.